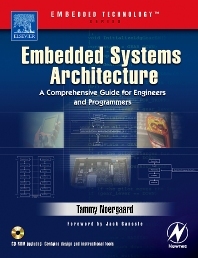 This comprehensive textbook provides a broad and in-depth overview of embedded systems architecture for engineering students and embedded systems professionals. The book is well suited for undergraduate embedded systems courses in electronics/electrical engineering and engineering technology (EET) departments in universities and colleges, as well as for corporate training of employees. Without a doubt the most accessible, comprehensive yet comprehensible book on embedded systems ever written! Tammy Noergaard is Chief Specialist in Embedded Systems at Terma, Denmark. Tammy has a wealth of professional experience including Technical Lead/Manager (Denmark) at Vestas Wind Systems A/S, independent consultancy in systems engineering and as a Field Engineering Specialist for two Silicon Valley-based corporations. She has also worked as a software engineer with Sony Electronics and Hyundai.